Playing with Curves - covering basic curved piecing, curved paper piecing with freezer paper, and free-form curved piecing . Continuous Line Quilting - covering "What is continuous line quilting, basic methods to more complicated ways of making a design continuous and converting a non-continuous design to a continuous line quilting design. A revamped version of Quilting Big Projects on a Small Machine with the addition of a demonstration of sandwiching a large quilt, making a block-by-block quilt without sashing, and other topics. Eight lessons cover five different methods for quilting a big quilt. Quilt the whole quilt - I show you how I handle big quilts in my standard home machine- or break the quilt into small pieces. If you have learned just the very beginning of how to do free-motion quilting, this class will add fun stitches you can add to your tool belt to make your quilts more exciting. You can make a fun fantasy garden stitch sampler as you follow along. 13 lessons. During this 6 hour class you will learn machine quilting your tops from the very beginning! Brand new quilters and those who just want to brush up on their skills are welcome in this class. We will cover stitching in the ditch, methods for basting, marking, threads and batting. Most of the time will be spent practicing free-motion quilting – both following lines and without marking. Also available as a half-day class, 4 hours. If you would love to know how to do more than meandering and straight lines, this class is for you. A half-day version of my Craftsy.com on-line course, we will talk about how I baste and set up for machine quilting, and cover some fun things like pebbling, pumpkin seed quilting, swirls and shells. 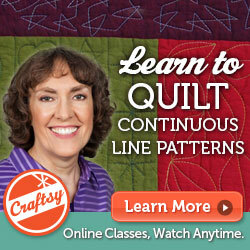 This is a class for those who have tried a little free-motion quilting, but want to learn more. If you would love to know how to do more than meandering and straight lines, this class is for you. 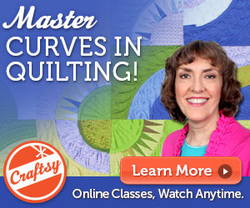 A full-day version of my Craftsy.com on-line course, we will talk about how I baste and set up for machine quilting, and cover some fun things like pebbling, pumpkin seed quilting, swirls and shells. This is a class for those who have tried a little free-motion quilting, but want to learn more. A new class in free motion quilting designs, this class is based on simple designs that are great for landscape quilts but also useful in many places on many types of quilts. Some designs are simple water,, contours, pebbling, leaves, flames, and sky designs, as well as others. 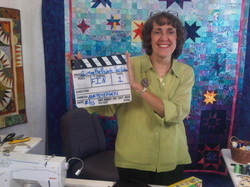 This is a class for those who have tried a little free motion quilting, but want to learn more. 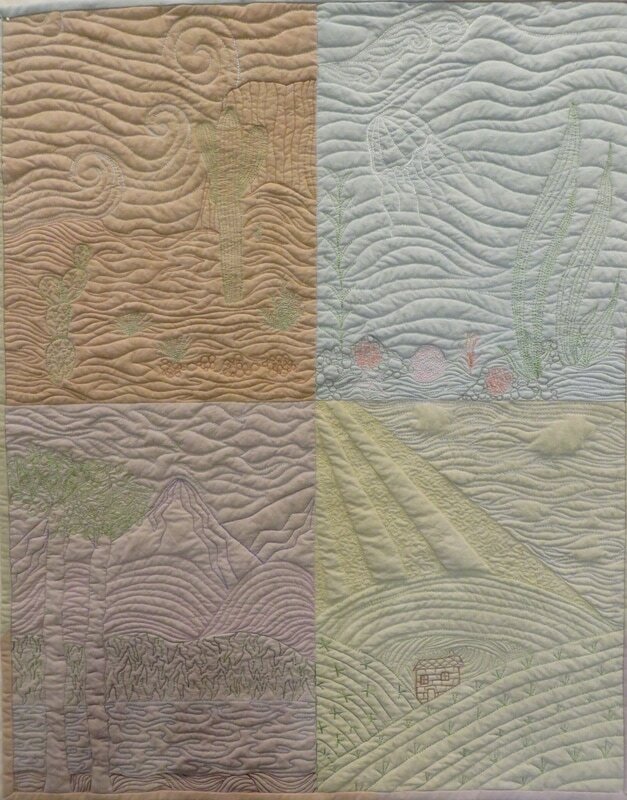 (See the quilting on the FreeForm Curves Landscape, below, for another example.) Students can make all or part of the sampler, or just learn the stitches and variations. Feathers are wonderful quilting motifs which can be use in many ways to fill different areas and can be done by a large variety of methods. This workshop takes you from learning how to draw a basic plume shape and then play with 19 different ways to make feathers. Come see how easy and fun feathers can be! Trapunto is a technique for giving quilting extra dimension. Traditionally it was done by inserting extra batting from the back usually, through a slit. This machine technique does not require opening the backing and can be a fun technique on many quilts. Make a block from one of my patterns and try it for yourself. Curves can be simple fun. These are really not hard to sew and this simple Drunkard’s Path block in a fairly large size (7”) is our project, but we talk about several methods for sewing, using acrylic templates or freezer paper for cutting, and we see other blocks using traditional curves. Available as a full day class or a half day class. Simple to cut and easy to piece, these free form curves can make a great landscape. Trees, mountains, and hills are just cut freely with gentle curves and then pieced easily together. This is simple and fun. Learn a fun, easy technique to add to your skills! The New York Beauty and Lady Liberty blocks are all the rage. I will demonstrate the basic steps to this kind of paper piecing curves and our project will be the simple New York Beauty quilt. Paper piecing using freezer paper and not sewing through the paper will be demonstrated, as well as a few other methods. Full day class only. This is a smaller version of the “Carmelized Sawblades” quilt which appeared in the Sawtooth- New Quilts from an Old Favorite book and contest. This is a combination of a traditional Sawtooth block with a New York Beauty block. Some knowledge of paper piecing is required, but the class teaches Ann’s preferred method of freezer paper, no tear paper piecing and how to sew curves. Available as a one or two day workshop. Learn to make very simple Log Cabin blocks and then learn how to change the block for many different looks. We will do blocks with different sized logs, different numbers of logs, wonky logs, gently curved logs and adding paper piecing to the logs. You can even learn to do a simple New York Beauty block, if you wish. Put together your own quilt with blocks that evolve over the surface to become something different. This is a quilt project for any quilter with basic piecing skills to those who want to just have some fun with new techniques. This original quilt is based on an off-center pineapple block which is paper-pieced. This quilt uses only 2 fabrics - one multi-colored and one solid black. Whether you are just learning to paper piece or just want to try something different , this is a fun class. It may be done in other color ways with more fabrics. Paper piecing with strips or freezer paper are the 2 methods that will be used. Patterns available in class. Full day workshop. This is a simplified version of Licorice Star Garden, which won a 1st Place in Houston World of Beauty Quilt Show. In this class you will learn paper piecing in the round and setting completed circles into a background. This is a 2- day workshop. This is a single star flower and leaf from the Mini Licorice Star Garden Workshop. A one-day workshop for a small wallhanging. Paper piecing in the round and setting circles into a background as well as preparing the leaf for hand or machine appliqué. This is an easy curve but the class is suitable for confident beginners because the block has many pieces. A one-day workshop for a small wallhanging with an 8" block. 1. See a demonstration on how to handle the quilting on a large quilt on a standard size domestic sewing machine. I will show how I baste to minimize tucks and wrinkles on the back, what I have found to be the best order for quilting, physically handling a large quilt. Lots of time will be provided for questions and answers and I will show some of my large prize winning quilts, all quilted on a small machine. 2-3 hours. 2. See a demonstration on 4 different ways to break a large quilt into pieces that are easier to handle than the entire piece. I will show how to split the quilt top into 3 or more pieces and then rejoin, how to split the batting, how to do a block by block quilting method and the medallion method. Time is provided for questions. 3 hours. This one hour talk and trunk show is about how I started to quilt and eventually became the quilter I am today. Trunk show includes items from my earliest class to my most recent show quilts. ​ June 28, 2019, 1:00 p.m.
An examination of what judges look for in a quilt, why I encourage participation in shows, how shows differ and quilts that have gotten poor and rave reviews (often the same quilts! Some of my best quilts were better due to needing to fix a mistake. I will show these quilts, and explain what went wrong and how I made the quilt better. So just what is "Quilt as Desired?" How to know what you desire on a quilt and a show and tell of some of my quilts along with the thought process for why I chose to quilt them as I did.